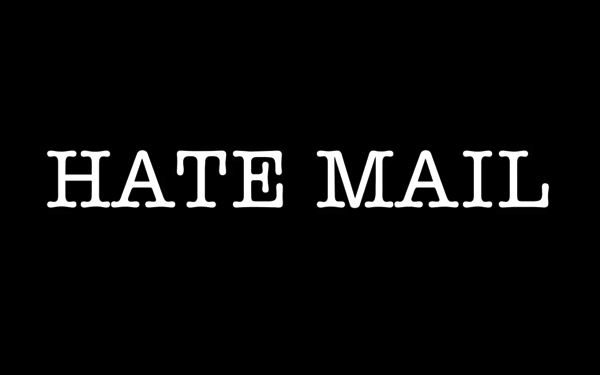 Do yourself a favor and make sure you attend April and Rob’s performance of “Hate Mail” tonight at the Jon Lovitz Comedy Theatre. Just click here for tickets and show information. And don’t worry, Jon Lovitz won’t be there. If you can’t make it out there, or you just don’t live in Los Angeles for some reason, but you still want an evening of passable entertainment, you can watch it live via the so-called internet. It’s only $4.99, which is less than you were going to spend on booze and Hot Pockets tonight. That’ll hardly put a dent in your SSI check. As if laughing at dumb people wasn’t its own reward, a portion of the proceeds will go to the Wounded Warrior Project. What are you doing Friday? Say, 8:00? If you said, “Having fun,” you were wrong. Rob Paulsen and I will be at the Jon Lovitz Comedy Theatre on February 8th, reading some of my favorite hate mail. We’ll be performing your flounces and angry Tweets and bad book reviews in a variety of cartoon voices. If you live in Los Angeles and want to come see whatever the hell this is, click here for tickets and show information. Our friends at UStream are going to broadcast this LIVE, so you can see it wherever you are. You can chat, you can complain, you can heckle us, and you can submit questions for the Q & A part of the show. And if you can’t watch it live, you can download the event from Ustream later, when you’ve sobered up. Like all marginal entertainment, HATE MAIL isn’t free. But it’s only $4.99, and a portion of that will go to the Wounded Warrior Project.